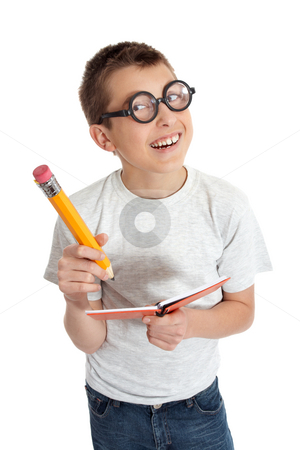 A comical boy student in geeky glasses writing in a book. Geeky student child wearing glasses. He is smiling and holding a notebook and oversized pencil. PLEASE NOTE: eyeglasses are fake and are intended to make eyes look distorted.